Associate Professor Dr. Kheswar Jankee, you have been the Ambassador of Mauritius to Germany here in Berlin since September 2015, how have you enjoyed the position so far and what has been the main focus of your work since you started? Indeed, the appointment of ambassador is an important milestone in my life and career. After the official ceremony with the President in September 2015, I was proud to see our national flag being hoisted. I feel privileged to be appointed as ambassador in such an important leading country like Germany which is a center of excellence and the heart of Europe. This is an important responsibility and my objective is to bring Mauritius and Germany closer in further consolidating trade, cultural and diplomatic relations. I always maintain that I am not a diplomat by career but my career in terms of my professional and work experiences has made me a diplomat. I have been a teacher, economist at the Bank of Mauritius , associate professor at the University of Mauritius and occupied important positions at the national level such as Chairman of national savings fund and Development bank of Mauritius. In addition, my involvement as an economic activist with economic policies , interest in political affairs and international exposure have shaped my destiny to become an ambassador. I have accepted this position with all humility and determination to work for my country. How important do you think the role of being the Ambassador of Mauritius to Germany is? 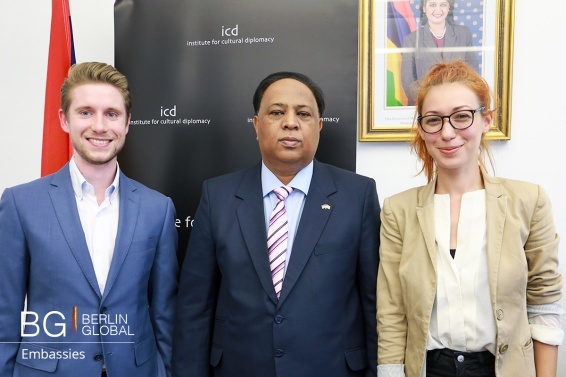 The government of Mauritius is expecting a lot from the Embassy at Berlin and the mission is already working on a plan of action to increase visibility, connect with diaspora, consolidate bilateral relations, integrate with different groups of ambassadors and promote trade and investment. As the representative of Mauritius, I should work in line with the economic agenda and social objectives of my country. How have the relations between Germany and Mauritius changed after the years and in what ways is the Embassy of Mauritius in Berlin promoting its cultural heritage? Mauritius started diplomatic relations with Germany in 1968, right after its independence .. In 2000, Mauritius decided to set up this Embassy to promote its diplomatic links with Germany. Mauritius is a country with an extremely interesting history, which owes a lot to cultural diversity. What is the role of an ambassador in Germany? Today I believe the traditional role has shifted from keeping strong diplomatic relations to the promotion of trade and economic relations. This is especially true for Mauritius, whose economic landscape is rapidly changing, on par with the rest of the developed world. Mauritius is at a crossroad: we want to move from a middle income economy to high income. At this stage major economic transformations and reforms are being planned. Clearly, since Mauritius sees in Germany a center of excellence for the quality of its institutions and its best practices, my mission as ambassador is to make Germany a partner in the future development of Mauritius. What does His Excellency consider to be the most important issues of cooperation between the Republic of Mauritius and Germany and in which areas do you think there is space for improvement? In my role of ambassador, my focus is on three main issues. The first is to increase Mauritius’ visibility on German media: I want Germans to know more about Mauritius as a country, and not only as major touristic destination. The second is the promotion of foreign investments and trade between Mauritius and Germany, which is part of my mission of economic diplomacy: Mauritius is a land with many business opportunities, and both German and Mauritian institutions are actively seeking to promote bilateral economic relations. The third is to connect with Mauritian diaspora and tap their expertise. Remarkable achievements obtained by the Embassy (being them of diplomatic, economic, social or cultural nature); past or upcoming events related to the Embassy. In addition to benefiting from various training programs and scholarships from Germany, there has been an unprecedented increase in the amount of students coming to study in Germany and moreover, an upward trend in German tourists to Mauritius. A very interesting cultural event which the mission has organized since my installation is the celebration of our national independence day . In order to connect with the diaspora, I invited all Mauritians in Berlin and nearby cities. Additionally, I am very proud to say that our embassy is extremely active also in other fields. My officers are promoting foreign investments , establishing links with universities and research institutes, working on training programs for diplomats, sports, and exploring ways to promote the Mauritius opera and film industry. Focus is laid on the emerging sectors of the economy such as the Blue economy, medical hub , education hub and Tourist/ leisure destination. How would you define Cultural Diplomacy instead, and what does it mean to you? 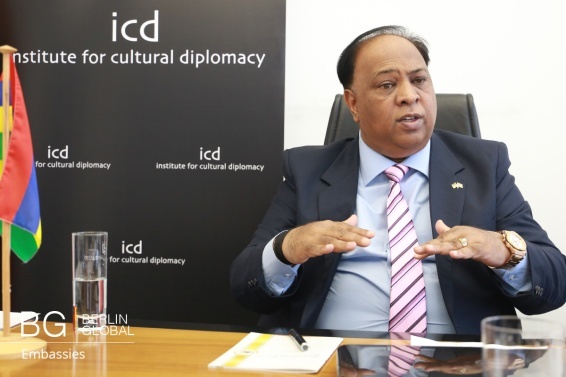 How can we use cultural diplomacy to strengthen the relations between Mauritius and Germany? For me cultural diplomacy is the exchange of information and ideas among different people and institutions. Why information and ideas? Because we need to have mutual understanding, among different countries. Once we have gained adequate understanding about each other, finding solutions to both petty and grand problems of our society can be easier and faster. Culture embraces a huge variety of subjects: there is culture in religion, in sports, even attitude is a reflection of culture. Coming to Mauritius, I believe the island is a showcase of cultural diversity. Mauritius is a place where cultures and languages had mixed. The first to settle had been the Franco-Mauritians, who brought their culture as well as the Afro- Mauritians manpower, slaves from various part of Africa. With the abolition of slavery and the beginning of indentured labor, brought their own culture, Indian- Mauritians came. Finally, with the annexation of the island into the British Empire, Chinese and other European minorities came, bringing with them the uniqueness of their own heritages. For all these coexisting cultures, Mauritius can very well be considered as a world in itself- something we are really proud of, probably even more than the natural beauties the island has to offer. When I think about what is happening in the world today, I feel extremely privileged to come from a country which such a strong social cohesion as Mauritius. People from all around the world come to Mauritius to witness our “Unity in Diversity” and find those elements that keep our society sturdy together. I believe the key elements are our respect towards other cultures and religions and our mutual understanding, which are only possible thanks to our propensity to share. Being a professor I have realized that talking is essential if we want to spread our culture and our diversity. I remember when I went to Berlin Economic Forum at ICD House, where I talked about Mauritius and the importance of culture. In fact, I believe the world today is more focused towards material growth, but they are missing cultural growth, which I believe to be of pivotal importance. I congratulate institutions like ICD that are actively promoting cultural diplomacy in the world. If countries around the world understand that cultural links and people are of equal importance to, and not less important than economic growth, I believe the majority of world’s social issues could be solved more easily. I am strongly convinced this is one the reasons why many economists are starting to use new indexes, like the Happiness Index or the Quality of Life Index. However, studying foreign cultures is just as important as spreading your own. When people do business abroad, they are most likely doomed to fail if they don’t have enough understanding of the culture of the country they want to work in. I have found myself in the same situation when I started to work here as Ambassador, and I realized that I had to read about German history and culture if I wanted to deal with Germans. This example could be very well generalized – people should have strong knowledge of one country’s culture if they want to have the most complete understanding and deal successfully with its citizens. This is part of my activity and also part of yours. Do you believe tourism in Mauritius can be a good mean to spread your culture abroad? If so, how? Can you provide an example? Up to now, tourism has been a very thriving and profitable activity in Mauritius. The number of German tourists visiting Mauritius is growing, thanks to the joint work of our Minister of Tourism, this embassy and other private business ventures. Tourism can be an excellent mean to spread culture, and I believe it needs to go in both directions; therefore, also Mauritians need to come to Germany and learn more about its culture. German tourists who go to Mauritius can learn a lot about its culture. For instance, they will notice that we speak a very specific dialect, the Creole, which is a fusion of English and French, although our national languages are English and French. Moreover, they can enjoy the most traditional dance of the island, the Sega Dance, which has African roots. Lastly, with important Indian and Chinese ethnicities in the island, tourists can see how multicultural and yet harmonious our country is, which I am convinced it’s the true beauty of Mauritius. H.E. the Amb. Has had a clear economic background. What advice would you give to young people who are interested in pursuing a career in international relations or diplomacy, but whose academic career has not begun from international relations? People sometimes take their whole life to understand what they really like to do. For instance now I am very interested in History and Anthropology, because I believe these two subjects are lenses through which you can interpret major events in the world today. Economy is my pet subject, and it will give you a very good insight about the world economy. However, other dimensions, like History and Sociology are just as important, and I recommend students who wish to pursue a diplomatic career to study them on par with their major studies. Mauritius is a marvelous island, with an extremely rich biodiversity that has made it one of the favorite destinations for luxury tourism. Its population is one of the most variegated on earth, and although geographically is in Africa, the main religion of the country is Hinduism. Do you think your cultural diversity has contributed to Mauritius’ prosperity and that it will contribute to its wellbeing in the future? Definitely. We should fight and make sure that given any economic strategy we pursue or any material growth that we have, there is a fair distribution of wealth, economic and social justice. By justice I mean that the distribution of material wealth should include all the different ethnicities, religious beliefs and cultures. In Mauritius we try to grand social equality by granting a Parliament composed by all the various ethnicities on the island, through an election system named “Best Loser System”. Today, we are proud to say not only that we have been the forerunners of this system, but also that it is giving extremely positive results in our country: our President, Bibi Ameenah Firdaus Gurib-Fakim, is the first women appointed as President of our country, and she comes from the Muslim community; our Prime Minister, Sir Anerood Jugnauth, comes instead from the Hindu community; our Vice President from another community. As symbol as it might seem, it still gives an important message – that in Mauritius religious beliefs or ethnicities are not subject to discrimination, but are rather elevated to the highest positions and we follow an inclusive approach. Additionally, Mauritius has a strong element of social protection, which is applied to all its citizens. Free education, free healthcare and subsidies are granted to all communities, not only to certain groups. For all this elements I believe Mauritius is a world showcase, and the living embodiment of positive cultural aggregation. Economically, Mauritius is a middle income country, a remarkable result considering not only its starting point after its independency, but also its lack of natural resources and its size. How much do you think cultural diversity has influenced the economic development of your country? As previously mentioned, Mauritius is at a crossroad. We had our first economic miracle in the 1990s, and we’ve always been an example of good governance and best practice for other African countries. Today Mauritius it’s transforming rapidly from manufacturing and agriculture to services. Mauritius aims to become a big platform to serve Africa; we want to provide our services to every country and investor. In order to do so, infrastructure is key: we are developing our port and establishing stronger flight connections with the major Asian and European cities. We’ve always considered our island as a link between Asia and Africa; it’s our ambition to become a link also between Europe and Africa. Moreover, our economy is going towards Ocean Economy and renewable energies, without forgetting the importance of traditional sectors like tourism. Mauritius needs to be a center of excellence, and we are putting all our efforts to promote education, trade and cultural aggregation. Given this position, we want investors to come to Mauritius and see it as a platform for Africa, and not only as a touristic destination. Investors have already expressed their interest in Mauritius. Given its stable government, its growing economy fostered by a strong banking system an, efficient bureaucracy and its membership to COMESA and SADC as well as close connections with Europe, Mauritius is an attractive investment destination. Personally, I have an open door policy at my embassy: people interested to know more about business opportunities, or simply interested about what to do or how much to spend for a trip to Mauritius are welcomed to enter and ask information either to me or to one of my delegates. Would you like to add something at the end? I would like to conclude this interview thanking you so much for this opportunity. Following this interview I hope that people in Germany and Europe will be interested in Mauritius not only for its tourism, but also for its cultural heritage and its many business opportunities.